Although the value of science and technology seemed unquestionable, federal agencies still needed to demonstrate the value they returned to taxpayers. This was particularly true as Americans began focusing, perhaps more than ever, on their economic prospects. The 1980s, after all, are often characterized as a time when Americans became preoccupied with money. And yet there was a collective uncertainty concerning how to explain economic growth and, in particular, how to sustain it. Thus, after decades of contributing to the national prosperity in myriad ways, NIST began efforts to formally demonstrate its influence. To contribute to the development of standards for medical and surgical devices, NIST researchers studied materials used in artificial joints. In 1981, the first formal analysis of the economic impact of NIST programs was published. A consultant estimated that the semiconductor metrology program significantly boosted the industry's productivity in the mid-1970s, improving product features and reliability, increasing production yields, and reducing costs-and providing social returns that matched or exceeded levels reported elsewhere for privately generated innovations. The study estimated that the metrology program's research contributed $30 million to $50 million per year to the semiconductor industry in the mid-1970s. More than 20 other economic impact studies since have been carried out for NIST laboratory programs, revealing substantial returns on investment. With U.S. firms facing growing competition in a global economy, NIST researchers found ways to improve on traditional manufacturing practices and materials. A robotic manufacturing system designed and assembled by NIST began operating at a naval shipyard in California, producing any of 40 different pipe connector parts used to suppress noise in nuclear submarines. Whereas it took 17 hours to make one part by hand, the workstation could machine the same part in less than 30 minutes. The Institute also began studying the properties and processing of materials as a basis for engineering new materials for products offering enhanced performance. NIST worked with auto manufacturers, for example, to find economical ways of making lightweight automobile frames out of reinforced plastics. In continuing its original mission of cooperating with and supporting the private sector, NIST emphasized programs designed to assist emerging industries such as biotechnology, space science, and optical communications. Biotechnology became a byword of the 1980s with the development of DNA fingerprinting for identification purposes and the advent of genetically engineered products. Accordingly, NIST, the University of Maryland, and Montgomery County, Md., formed the Center for Advanced Research in Biotechnology (CARB), designed to be a multidisciplinary center of protein engineering. Among their achievements, CARB scientists worked with industry to alter an enzyme found in common soil bacteria so that laundry detergent containing the enzyme could better tackle tough stains, overcoming a long-standing problem in that industry. Meanwhile, NIST began producing standards to ensure accuracy in forensic DNA analysis. This technology was one of dozens for which NIST scientists have won R&D 100 awards, given annually by R&D Magazine for the most technologically significant new products of the year. Space science advanced after the first reusable spacecraft, the shuttle, was sent into orbit in 1981. 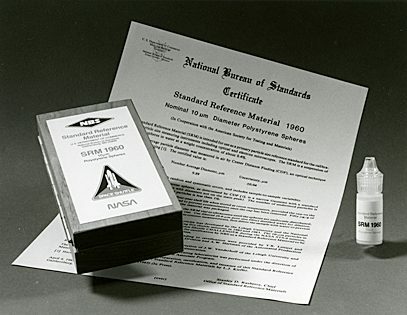 NIST actually made the first sales of a product manufactured in space, in the form of a measurement tool. Billions of tiny polystyrene spheres, made highly uniform in shape and size in the low-gravity environment of space, were made available as a Standard Reference Material for calibrating instruments used by medical, environmental, and electronics researchers. Such instruments could be used, for example, to count and measure the shape of blood cells. Another project involved radiometric calibrations of an optical simulator and light sources for the Hubble Space Telescope, put into orbit in 1990. NIST was the only lab in the world that could provide certain types of calibrations essential for space-based astronomy. Back on Earth, fiber-optic technology began to show up in U.S. communications systems because it could carry far more data than traditional copper telephone lines. NIST had anticipated this trend when its staff began characterizing optical fibers in the 1970s. These hair-thin strands of glass carry information in the form of light waves emitted by lasers. As fiber optics became more pervasive, the NIST program expanded to include measurement and calibration services and research on devices that send, receive, and process data. There was some urgency to this work because, although Americans invented the core components of optical technology, Japan had taken the lead in marketing products based on them. By the mid to late 1980s, U.S. leaders were increasingly worried about foreign competition, principally from Japan but also from Europe. A deluge of government and industry reports warned that America was falling behind in key technology areas, succumbing particularly to Japan's ability to commercialize U.S. inventions first and manufacture products efficiently. One of the more timely examples was Japan's success in commercializing the video-cassette recorder, which had been invented years before by a U.S. company. A key part of the federal government's solution to this problem was NIST, which had been reorganized and redirected several times in its history, but never so dramatically as in 1988, when the Omnibus Trade and Competitiveness Act was passed. The purpose of the act was "to modernize and restructure [NIST] to augment its unique ability to enhance the competitiveness of American industry while maintaining its traditional function as lead laboratory for providing the measurements, calibrations, and quality assurance techniques which underpin U.S. commerce, technological progress, improved product reliability and manufacturing processes, and public safety." To go along with the expanded mission, its name was changed from National Bureau of Standards to the National Institute of Standards and Technology, and two new programs were added. The Advanced Technology Program (ATP) was designed to encourage private investments in innovative technologies with the potential for broad national benefit that otherwise would not be developed in time to be competitive in world markets. The Manufacturing Extension Partnership (MEP) was initiated to assist the 385,000 small U.S. manufacturers with a wide range of activities through a nationwide network of not-for-profit centers. These two efforts complemented the Baldrige National Quality Program, created in 1987 to manage the Malcolm Baldrige National Quality Award, which recognizes individual U.S. organizations for their achievement, and to promote quality awareness and provide information on successful performance strategies.